Fall is my favorite time of year. The leaves are changing, cooler weather and such fun holidays coming up. Today I have a collaborative post with a few of my favorite bloggers to bring you guys some of our fall favorites. Things we are loving this month. So be sure to check theirs out as well. I will have their links below at the end of the post. Everything pumpkin! I am such a lover of pumpkin anything. From coffee to scents it’s all about the pumpkin! If you follow me on Instagram this should not come as a surprise, I’ve only added a million pumpkin iced coffee pics this season already. Speaking of pumpkin and cooler weather. This Creamy Parmesan Pumpkin Soup has been one of my go-to favorites since it’s becoming soup weather. My family can not get enough of it. Fall candles and hand soaps from Bath and Body Works! Every year I stock up at the end of the season for the following years scents. I’m sort of theme/season OCD, I know shocking my type A personality has OCD. Drives my sister crazy! I have been burning these non-stop, of course, my favorite is the pumpkin apple. When you think of fall you don’t think blueberry but I had to include these Quest blueberry muffin bars on my fall favorites list as they have been my go-to protein post workout snack lately. They taste just like a blueberry muffin with crumb topping and all. Fall favorites would not be complete without a few personal items I have been using. Fitness – more running and cardio. I know gasp I have not really done much of either in a long time but now I can with the cooler days. In Florida, if I wanted to take a jog or walk around my neighborhood I would be melting in 5 mins. I love walking or jogging up to the mailboxes in the evenings just to get that little bit of cardio in and it feels great. I purchased a new armband from Tune Belt for my iPhone making the jogging easier. Yeah I know I am late to this party but I never needed one before, I was not an outdoor runner. Ok, I’m not now either but I think to think I am, wink! Boots and Sweaters! You guys do not understand how much I’ve missed the chance to get to wear either of these. Now that we moved I’m in love with all fall clothing. I picked up these Candie’s boots a few weeks ago. They are a great staple piece I can wear with so many different things. A beauty favorite I’m loving this month is an oldie but a goodie. With the chaos of moving masking was nothing I had time for. My skin was showing it though so I fell in love with my GLAMGLOW GRAVITYMUD mask again. It firms and tightens makes me feel like a million bucks when I use it regularly. Lastly, I have to mention 2 massive time savers I got back into this month. Freezer cooking! I did this when my kids were itty bitty but never really kept it up. Well, this month I’ve done a few rounds and my freezers are stocked. I love being able to just pull meals from the freezer for meal planning it saves so much time and money. Crockpot cooking. I go through phases with my crockpot but I’ve really been loving it more this month that I’ve been still decorating and unpacking endless boxes I can’t wait to make my Crock Pot Apple Crisp after we go apple picking soon! So there you go all of my fall favorites for you guys to check out. What are some of your fall favorites this year or fall traditions you have? Be sure to check out what my fellow blogging friends fall favorites are too! Let them know Jenn sent you. Need some extra activities for the kiddos? 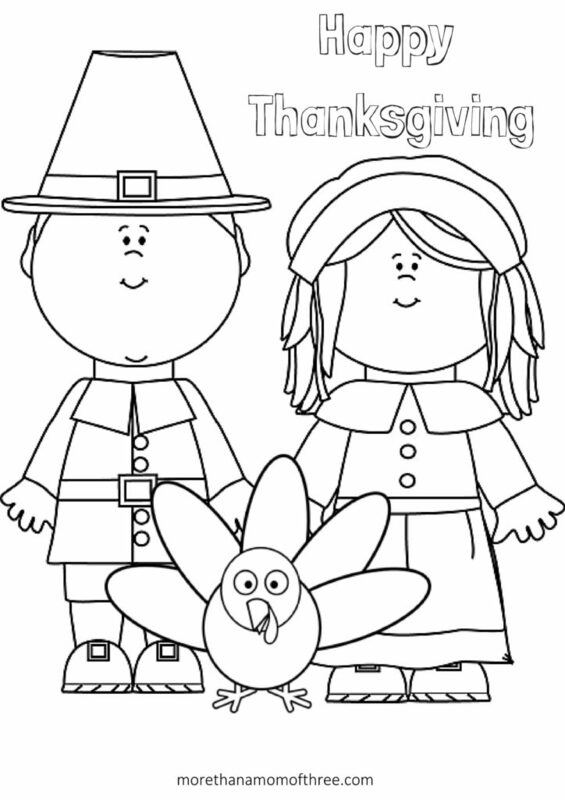 Here are some Free Thanksgiving Coloring Pages Printables to keep those little hands busy. I hope everyone had a great Halloween last Friday! Now it is on to the Thanksgiving festivities. It will be here before we know it. I feel like this time of the year goes by so quickly, right? So many fun holiday events and a lot of family get-togethers to enjoy. For us, this time of year is all about enjoying the kids. From Halloween straight into the New Year we make our best memories. Even though it is such a busier time of the year, I still try to make it extra fun for the kids. What better way than some Thanksgiving coloring pages! 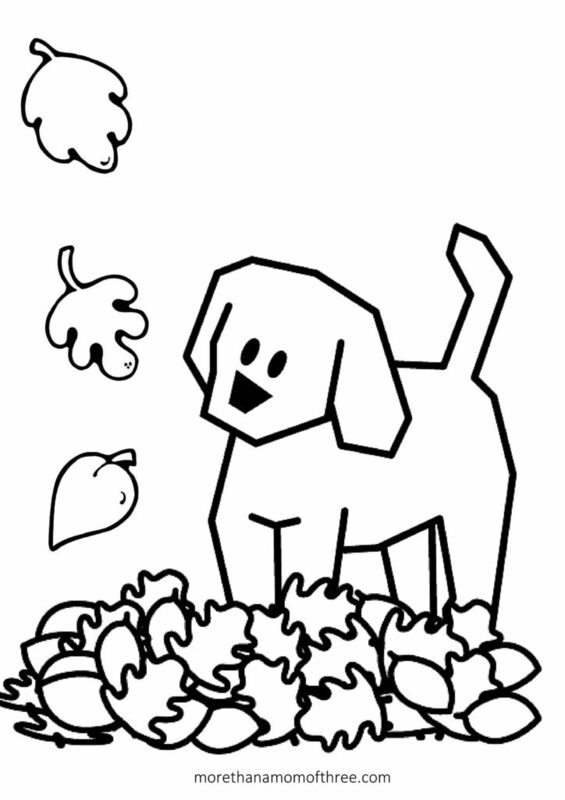 I have three free Thanksgiving coloring pages for you guys today. Coloring is still a favorite of my kids. With all the extra cooking these days, I can easily set them up next to me at the table so they can color and I can concentrate on cooking. Before fall even hit I was scrambling looking for reasons to put pumpkin in everything. If you know me, you know I am a bit of a pumpkin fan obsessed. From coffee drinks to soups (stay tuned a recipe for pumpkin soup). 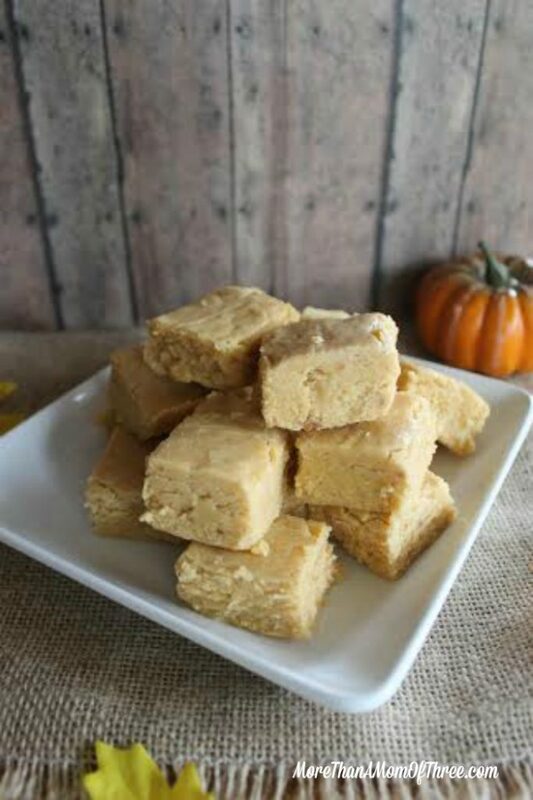 This delicious pumpkin pie fudge recipe has become a family favorite every year, even the members of the household who are not the pumpkin fans that I am, go crazy for this recipe when it makes its annual appearance. It is very rich, I definitely recommend making your pieces small. 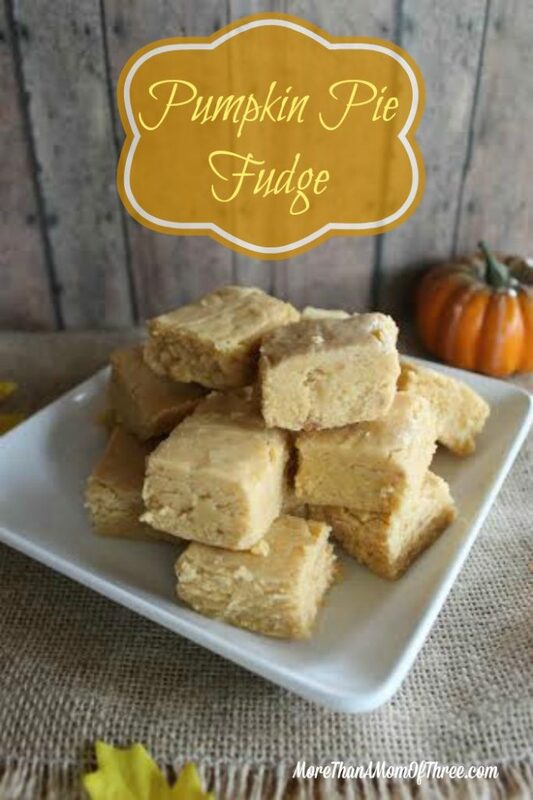 I love making different kinds of fudge for the holidays and this one is a winner for the fall months. Perfect for a Thanksgiving dessert too. It’s simple and aimed to please especially those pumpkin fans like me. Line an 8×8 pan with waxed paper or parchment paper. 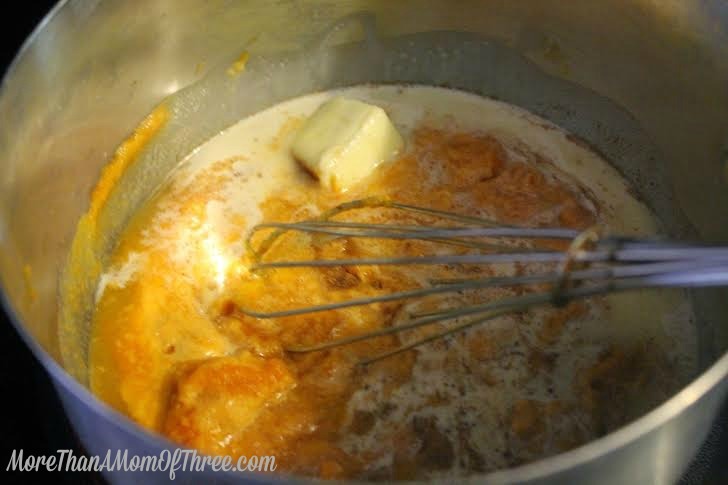 Combine sugars, pumpkin, milk, butter and pumpkin pie spice in a large sauce pan over medium heat- bring to a boil. Allow mixture to boil for 12 minutes. 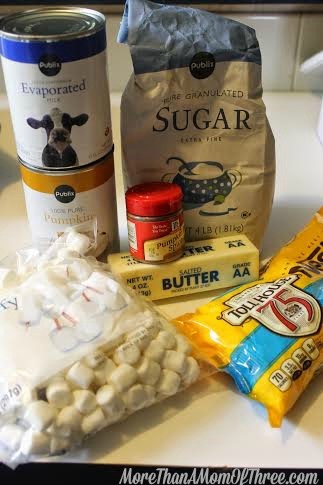 Stir in marshmallows, white chocolate chips, and vanilla extract until smooth. Pour into parchment paper lined pan. Place pan in refrigerator for at least 2 hours to allow fudge to set. Lift fudge from pan using paper, cut into small squares. 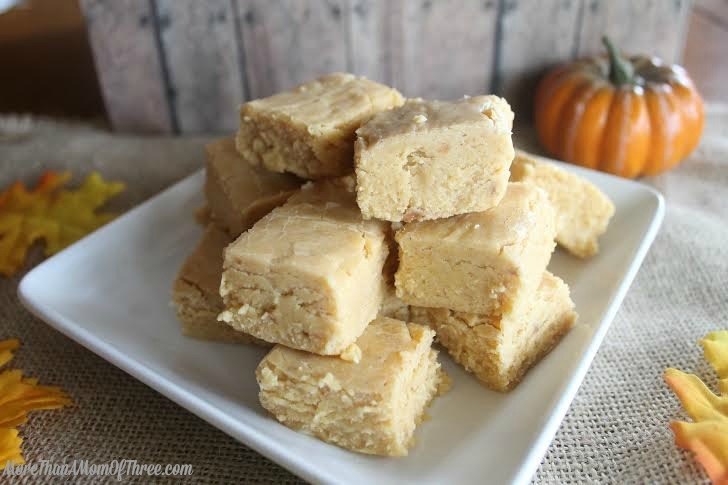 Have you ever tried pumpkin pie fudge? What are your favorite ways to use pumpkin? I am always looking for different recipes, I can never get enough of it this time of year.